It turns out that being 22 and capped at an A2 licence, as well as measuring a miserly 160cm (5’ 3”) makes it rather difficult, or even impossible, to test ride bikes at dealerships. I am currently riding a Honda CBF500, but having covered over 6000 miles in 4 months, I am now eager to see and discover the world of bigger and more powerful bikes. 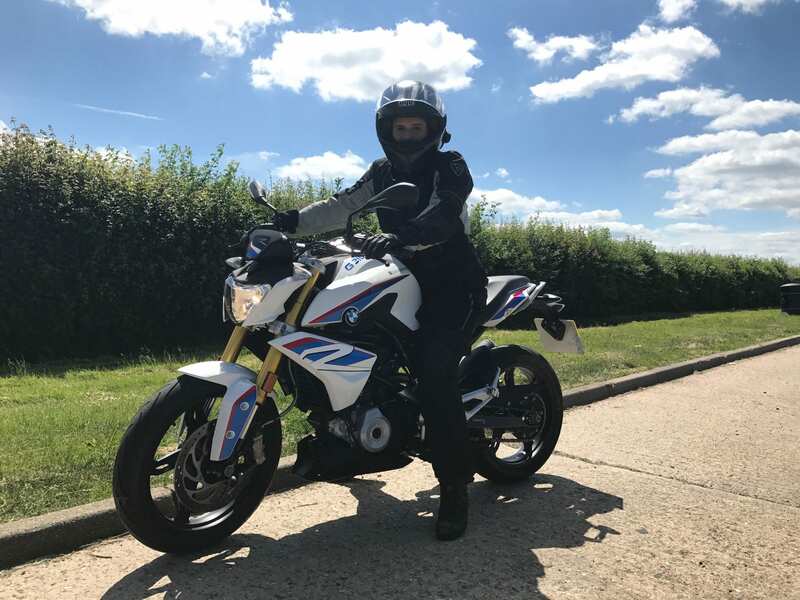 However, when you add height and age into the equation, finding such bikes whose engines are capped, that have a low suspension and low seat, becomes rather limited; so, when BMW Bahnstormer Maidenhead offered me the chance to test ride the new G310R, I leapt on the opportunity. At first sight, the bike appears to be rather ‘cute’. With a small and petite frame, it is easy to manoeuvre on the ground, is light in the hand and sits neatly. However, take a second glance and you see a completely different beast. You soon realise that despite being small and sweet, this bike has attitude. Its flashing colours demand presence and its fierce, sharp lines and complex angles make it look powerful; you cannot miss it on the road. When mounted, I could comfortably touch the floor with both feet, which gave me a lot of reassurance. So, we were off! Well, after stalling 3 times… it turns out that the clutch was much harder than I am used to and has to be truly pulled to have an effect something I am not used to. Nevertheless, there were various aspects of this bike which must be mentioned. Firstly, as expected from a single cylinder bike, vibrations are quite noticeable. The vibrations become more present when reaching higher speeds, mainly on dual carriageways and motorways. Secondly, due to the small size I could not help but feel like a monster on top of a fly after minutes of riding it – I felt huge. With no screen or any weather protection, I felt as though using its powerful brakes well enough, I would end up flying over the handlebars. You can clearly tell that the bike has not been designed for long distance touring but for quick blasts around the city and short rides through the bends. Having said all of this I like the bike, there is no denying that it is fun to ride. Despite this, I believe its utility falls into two categories. It can either be used as the perfect first bike, especially for shorter, smaller women, or as a commuter’s bike. For both these jobs, it is agile, small, listens to what it is told, moves quickly and sharply, is light to handle and looks the part. However, for someone like me, who wants to tour, cover miles and see the world, this bike simply does not have enough power. I would like to thank BMW Bahnstormer Maidenhead for allowing me to test ride this bike. For more details about the bike check the BMW site about the G310R here. Thanks for the review! It is the first one I’ve seen for the new platform and it was very comprehensive. I am thinking about downsizing from a GS 1200 for several reasons but still want to cover some distance on occasion so this may not be the one for me. Thank you very much for the comment! I am glad you found the review useful. Yes, it sounds like this bike may not be the one for you… I shall have to test ride more to give you a better idea of the other options, hehe. You may find my latest review on women’s biker gear useful as a fellow biker lady. Take a look! Just discovered you prompted by the BMW Club magazine article. Like what you are doing! Rock On! Did you see us in this months magazine? ?